Powers/Abilities: Possesses the strength of fifty men. History: Frankenstein's monster awoke from more than a century of dormancy to find the castle where he had been "born" in was now surrounded by a modern US city. Disguising his monster status with a lifelike rubber mask, he ventured out, soon rescuing an unfortunate millionaire from a car wreck. Though the man died, he bequeathed his fortune to his rescuer. 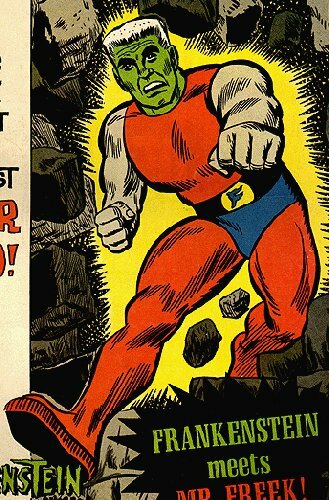 Assuming the identity of industrialist Frank Stone, the monster led a double life as a costumed superhero. Comments: Created by Don Segall and Tony Tallarico, inspired by the Mary Shelley character. Dell's Frankenstein #1 was an adaptation of the 1930s movie version of the Mary Shelley novel, and the superhero version of the character didn't debut until the second issue. He appeared in three issues (2 through 4) before the title cancelled.